Citing the videogame industry's birth in commercial arcades, Microsoft's Eric Havir suggests Surface may be just getting started taking over the game industry. 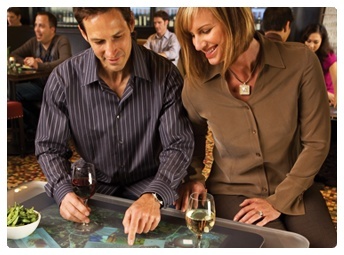 Already installed in a number of venues around the world, including the Palms casino in Las Vegas, Surface allows users to play by touch, using off-the-shelf processor and infrared camera technology. In addition to casinos, the Surface is landing in educational institutions and in hospitals, helping victims of head trauma and other injuries regain motor control through gaming. According to Microsoft's Surface Game team lead, Gretchen Richter de Medeiros, gaming accessories and controllers are the biggest "barrier to entry" for a large potential gaming audience. "Being able to touch and interact [with the game]", she says, "brings some of the magic back." The Surface game team's goals are, among other things, to create gaming experiences that are more like board games than traditional videogames. Citing Hungry, Hungry Hippos, de Medeiros says there's a bigger audience for games than the market has currently captured, and touch-gaming will help the industry reach them. "Bringing people back together in real-time, in real space, looking each other in the eye [as they play]," she says, is the goal of Surface in the game space. The technology allows for upwards of 52 simultaneous touches and recognizes specially-tagged objects. You can roll a pair of six-sided dice on the surface, for example, and by reading the number on the bottom of the die, Surface can tell what number is on the top. Playing touch-based games can be a frenetic and strangely unique social experience, as multiple players can take their turns simultaneously, crowding around the table in very close proximity. The tech can also recognize from which direction a player is reaching and restrict access to certain game pieces and elements to people seated on specific sides of the Surface. Using real-world objects as part of the game design, says de Medeiros, let's designers "connect the physical world with the digital world in a way that feels magical." Microsoft and development partner Vectorform showed off a number of prototype game designs at GDC, most of which were little more than technology tests at this stage, but they hope that their appearance in San Francisco and at PAX East in Boston later this month will spur game designers to create innovative new applications for the device. According to Havir, Microsoft, the software and gaming giant that coined the phrase "a computer on every desk in every home," now believes it will only be a matter of time before there's "a Surface on every surface." Just don't expect to get your hands on one any time soon. The Surface currently retails for $12,500.